On Wednesday, March 21, 2012 authors Daniel Halperin and Craig Timberg arrived at Book Passage in Corte Madera as part of a promotional tour for their new book Tinderbox. 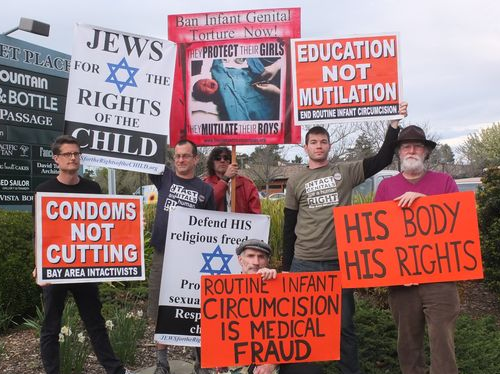 But instead of encountering praise and autograph requests, they were met with protesters from the group Bay Area Intactivists who condemned the authors for using Tinderbox to extol male circumcision. During the audience Q&A, Halperin and Timberg sidestepped questions from intactivists and denied their book's glowing portrayal of male circumcision. Both seemed either unaware or unwilling to acknowledge the many functions of the foreskin and the damage caused by excising it. Male Circumcision and HIV has published video from this protest.